Designing products is a complex process riddled with challenges. Fortunately, teams can take advantage of innovative approaches that help to eliminate the potential risks of product development and become more productive to ensure faster time to market. One of such methods is the Design Sprint. Giants like Google, Airbnb, Slack, and Salesforce use this methodology to develop amazing products that bring tangible value to end users. The approach is relatively new, and many companies aren’t sure how to capitalize on it for their product development processes. 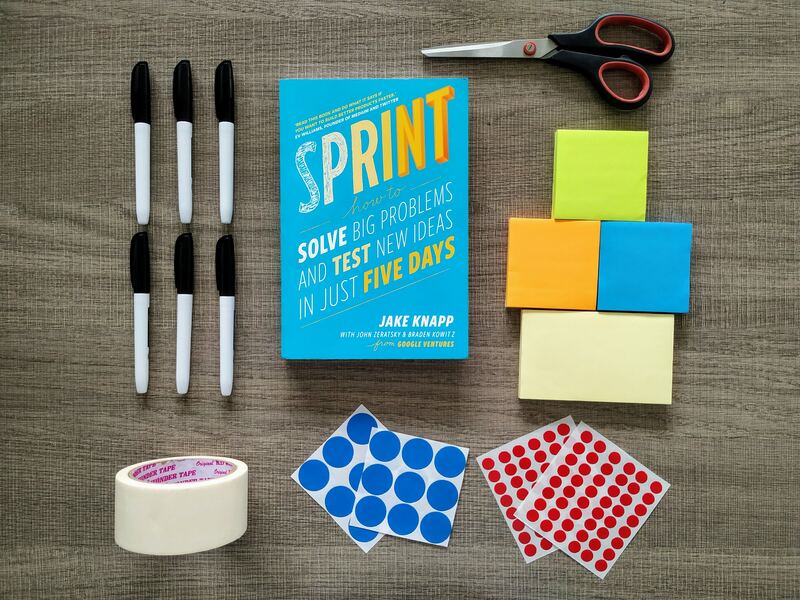 Read on to find out what the Design Sprint is, what its key benefits are, and how to make the most of this strategy at your organization. What is a Design Sprint and why should I care? A Design Sprint is a tool that helps teams to quickly discover product development risks and ensure that the product is aligned with the critical business needs of their company. A typical Design Sprint spans over five days to complete the process of validating product ideas and solving challenges through prototyping and testing with end users. Day 1: Understanding the problem, mapping it out, choosing the most important areas to focus. Day 2: Brainstorming new ideas, sketching out competing solutions on paper. Day 3: Making decisions, turning ideas into testable hypotheses. Day 4: Prototyping, putting together all insights to develop testable prototypes that represent the idea accurately. Day 5: Testing, getting feedback from end users and summarizing key insights. The process is simple and brings companies significant results in a short time frame. But that’s just one of the many benefits of the Design Sprint approach. It focuses on end users – the process is user-centered and concentrates on building products based on a solid understanding of customer needs. Validation and feedback are essential parts of a Design Sprint. It includes all the stakeholders – Design Sprint encourages cross-team collaboration by involving different stakeholders and acting against bureaucracy and siloed organizational structure. It also helps to get stakeholder buy-in early on and builds trust between all the stakeholders throughout the sprint. It’s efficient – there’s no place for inefficient discussions during the Design Sprint. During these five days, the team focuses all their efforts on producing a realistic deliverable by the end of the week. That concentrated timeline works wonders for teams that struggle to stay creative and productive during long, back-to-back meetings. It helps the team to learn (and fail) fast – during the Design Sprint teams get a clear vision of their product goals. The method forces them to make crucial decisions and solve challenging problems quickly to develop a testable prototype that validates their ideas instantly. That way, organizations can save months of design, engineering, and development costs to ensure fast time to market. Now that you know why the Design Sprint approach is gaining traction among organizations, it’s time to see how you can implement it. Here are a few tips to help you make the most of this process. The idea behind the Design Sprint is building a testing a prototype in five days. Sounds challenging, doesn’t it? But your team can accomplish that if you launch your Design Sprint with a solid foundation in place. Make sure that your team is small. Clear their schedule for a week and stick to the step-by-step step product design checklist. Monday – carry out a series of structured conversations to build a focus for the sprint. Avoid meandering discussions and concentrate on acquiring as much information as possible on potential product design paths. Define key questions and long-term goals, make a map of your product and then ask experts on your team to share their feedback. Pick a target from your map that presents the greatest opportunity. Tuesday – this day focuses on solving the problem. Avoid typical barnstorming sessions. Instead, ask individual team members to prepare detailed sketches backed by critical thinking. Every decision needs to have a good reason behind it. Wednesday – you’ll start this day with a stack of potential solutions in front of you. Decide which of these sketches could be good candidates for prototyping and testing. Combine the winning elements from the sketches into a storyboard that will serve your step-by-step plan for prototyping. Thursday – on this day, your team builds a realistic prototype of the solution in your storyboard. That way, you can deliver a finished-looking product to your customers for testing. Friday – to learn whether you’re on the right track, you need to get out there with your product prototype and test it with real users. Show your prototype to five customers during five one-on-one interviews. You’ll get plenty of valuable insight before product launch! To make the most of the Design Sprint, focus on the ‘what’ your process. It’s easy to fall into the trap of concentrating too much on the ‘how’ while planning a sprint. The organization of the sprint isn’t critical to its success. First, decide what problem the sprint will be dedicated to. You need to prioritize product issues and questions correctly before setting the agenda for your sprint. Avoid vague problem statements and define the problem in as much detail as you can: What’s your product focus? Who are its users? What are the project limitations? Don’t forget about the ultimate objective of your Design Sprint which is delivering a realistic prototype that mimics the final product and, when tested with real-life users, will bring you valuable insights. Have your team concentrate on building that prototype. You need to learn about the product’s unknowns and assumptions. Determine the medium for your prototype by time constraints and specific learning goals – for example, paper, presentation software like Keynote, and HTML/CSS can all be good prototyping media for your project. Consider what kind of questions you’ll be asking the end users during the testing phase. Which functionalities would you like them to review for you? Which uncertainties are you aiming to resolve? Build a prototype with testing in mind, have a plan for testing, and always develop a list of testing outcomes. Testing your idea helps to learn more about things you didn’t know about and crystallizes your understanding of the future direction for the product. Observe and interview customers who interact with your prototype. Once the testing phase is over, prepare a summary or report of your learnings together with a well-defined plan for moving forward, beyond the confines of the Design Sprint. The Design Sprint approach helps teams to avoid the endless-debate cycle and compress months of brainstorming into a single week. Instead of waiting to launch an MVP to validate your product idea, create a realistic prototype and start getting feedback right away. You’ll be able to fast-forward into the future to see how customers react to your finished product before making any commitments. Are you looking for a team of experts to help you carry out a productive Design Sprint? Get in touch with us; we help organizations make the most of this method in their product development efforts.